Samford University is one of the top schools in the United States ranked by U.S. News & World Report for granting merit-based financial aid to the most students. Samford is the only college or university in Alabama recognized in the national ranking which was released Oct. 24. For 2016-17, the year on which the rankings are based, 47.5 percent of Samford’s undergraduate students received merit-based financial aid. 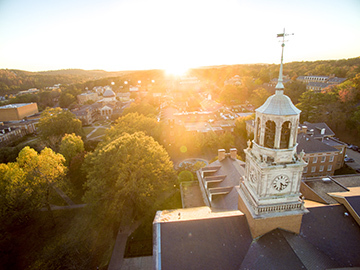 This placed Samford sixth among the 10 schools highlighted in the national ranking. According to U.S. News, merit aid, sometimes referred to as non-need-based aid, comes into play when colleges use funds to attract desirable students. Typically, these students have a stronger academic profile or a specific talent, such as standing out with a particular extracurricular activity. Samford continually is recognized nationally for value and affordability and was ranked 40th nationally for value by Kiplinger’s Personal Finance this year. Samford regularly is recognized as the top-ranked university in Alabama, most recently by Forbes Inc, The Economist and The Wall Street Journal, and as one of the premier Christian universities in the country. In its 2018 rankings of the best colleges and universities in the country, U.S. News & World Report ranked Samford third among regional universities in the South. At each of the 10 institutions recognized in this latest ranking from U.S. News and World Report, more than 43 percent of full-time students in fall 2016 received merit awards. These colleges and universities gave merit aid at the highest levels, much higher than the average award of 14.5 percent given across the 1,111 colleges and universities that are included in the annual higher education rankings published by U.S. News.